E Cube, Inc. is a pioneer and national leader in building optimization and commissioning, with over thirty-five years of experience supporting world-class building projects. Commissioning accounts for over 90% of our typical work load. You will not find a better team of professionals with this level of knowledge, expertise, passion, experience and customer focus. E Cube specializes in the commissioning of hospitals, laboratories, data centers and other mission-critical facilities. 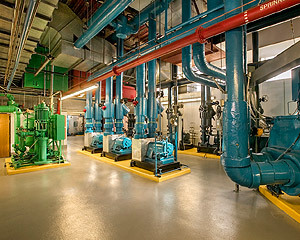 We also provide commissioning services for other types of facilities including central plants, higher education, military installations, commercial offices, high-rise residential, and municipal facilities. E Cube is also a leading provider of LEED® commissioning services with over 170 LEED projects nationwide. Our staff consists of a wide range of professionals including mechanical engineers, electrical engineers, architects, facility managers, TAB technicians, controls technicians, and HVAC contractors. We are LEED Accredited Professionals and leaders in the sustainable building community. Other services provided by E Cube include retro- and re-commissioning of existing buildings, energy analysis consulting, measurement and verification, and utility company energy efficiency program support. E Cube, Inc is headquartered in Denver, CO with offices in Loveland, CO, Chicago, IL, Salt Lake City, UT, Oakland, CA, and San Diego, CA.